PRACTICE MAKES PERFECT: Carmen Diaz, played by Nikki Hunt, center, and the cast of �Fame, Forever� rehearse at the Waterville Opera House last Thursday. The Waterville Opera House will host the U.S. premiere of the musical on Friday night at 7:30 p.m.
WATERVILLE -- It's a typical week before the opening of a show, where the director is making subtle changes to actors' movements, the stage is taking on color and everyone's got a bit of the jitters. But on the set of "Fame, Forever," there's a sense of excitement unlike the usual momentum that builds in a pre-show countdown. The cast and crew know they're into something big. When the musical opens Friday at the Opera House, it will be for the first time in this country. The U.S. premiere of the sequel to "Fame, the Musical," also will be attended by its creator, producer David De Silva, as well as Ben Winter, who wrote the books and lyrics, and Steve Margoshes, who wrote the music. "Everybody -- the technicians, creative team, artistic team, actors, musicians -- we all want people in the central Maine area and Maine as a whole to experience a U.S. premiere," says director Debra Susi. "It's a pretty special thing. It doesn't happen often -- it just doesn't." "We want everyone to be proud of the work that we have done and David is so passionate about this show. We want him to see this show as he envisioned it. This is his creative baby and we're so thrilled and honored to be part of the chain of development." The original "Fame" is about students who audition for the New York City High School for the Performing Arts and the story follows their struggles and triumphs after they are accepted. "Fame, Forever" takes place 20 years later and reveals the fates of the original characters, now grown, and their children, who are students at the school. Susi directed "Fame" at the Opera House last year and De Silva, looking for a place to host his U.S. premiere, had heard Susi's show was successful and chose Waterville for the big event. 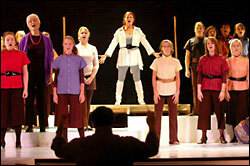 The musical enjoyed its international premiere in Glasgow, Scotland, in May. Susi attended. On Thursday night, her cast and crew were on a roll, readying for production on an exquisitely crafted set that the Opera House's executive director, Diane Bryan, calls extraordinary. "This one is really ambitious for what we have here," she said. "We've really pushed the limits to make this something spectacular. We will succeed." The musical itself is delightful, colorful and original. When the entire 40-plus cast is on stage, belting out tunes, the Opera House explodes with energy. "It's a great show," says actor Kim Gordon, who plays Greta Bell, a teacher at the New York School. "I'm the oldest cast member," says Gordon, a Waterville resident who has performed in some 50 shows. Gordon says a feeling of unpreparedness always pervades a set a week prior to a show -- but it always comes together. She says she is 100 percent confident in Susi's ability to pull it off. "She just works miracles on the stage," Gordon said. Cast members come from all over central Maine and beyond. Some are college students who were in shows at the Opera House this summer and commute for nightly rehearsals from the University of Southern Maine and University of Maine. As with any new show, the creator sends last-minute changes to the director on a regular basis and Susi tries to accommodate them. She got her seventh script from De Silva 1 1/2 weeks ago; musical director Michael Peterson was delivered a music change on this particular Thursday. "It's the nature of a working show," says Peterson, of Oakland. For Susi, the process is fun and exciting, albeit a bit daunting at times. "I don't get a whole lot of sleep," she says. "I may start, but at some point in the night my eyes pop open and I say, 'Oh, my gosh, did I do that?' or "Is that scene working?' "
Susi talks with De Silva frequently and has discovered, she says, that his enthusiasm and passion for theater arts education is genuine. "It's who he is," she said. "Everything he does is about theater arts education." De Silva is scheduled to arrive in Maine Thursday and see a preview that night. Known as "Father Fame," he conceived, developed and produced the 1980 Academy Award-nominated picture, "Fame," and worked on the theater version, which came later. When "Fame, Forever" leaves Waterville, it will travel to the Sarasota/Bradenton area in Florida, and then head west, according to Susi.